Remember the last time you got into a verbal conflict with someone? Uncomfortable, right?! Learning how to become better at making conflict less damaging is important. Using active listening during an argument is of course a great way to alleviate the situation and solve whatever problems have surfaced. But when people have strong feelings about an issue, their emotions generally impact their ability to speak and listen effectively. That’s why it’s so important to use a variety of techniques to help both people feel validated, respected, and heard. 1. Take issue with the problem or behavior, not the person By consciously dealing with the issue or the behavior, you avoid attacking the other person. If you are quarrelling with your teenager about her curfew, focus on the issue of the curfew or her behavior of breaking curfew. Avoid bringing up past behaviors or saying calling her “a crazy kid who doesn’t do anything right.” While that may well describe your feelings, it’s attacking and will harm your ability to move the conversation in a productive direction and may create barriers in your relationship. Listen to what your teen has to say and keep the conversation focused on the issue. Decide to be an active listener even if she isn’t. Your ability to stay focused on the issue at hand and refrain from attacking her character will help a difficult conversation to be more manageable. 2. Understand that we all have value. Its impossible to speak or listen in a respectful manner if you see the other person as inferior or insignificant. You certainly don't have to agree with that person, but it is essential that you appreciate and respect his right to a differing opinion and recognize his value as a person. It's easier to do if you can find something that you have in common and if you try to understand why he feels the way he does about this particular issue. 3. Avoid absolutes – always/never, bad/good, right/wrong. Saying things like "you always" or "you never" are rigid statements that hinder communication. Especially during a conflict, messages like these are likely to elicit a defensive response which makes effective communication difficult. An active listener will sense these absolutes and ideally counter with something like, "I hear you saying I always do such and such, but actually I..." The same issue occurs with statements that indicate right/wrong or bad/good. There are absolutely times when things are right or wrong, bad or good, but when engaged in a conflict most right/wrong or bad/ good statements are exaggerated out of hurt or angry feelings. Statements that try to simplify complex situations often have the effect of polarizing a conflict. Each party then is focused on defending herself and defining her personal position, not necessarily on working through the actual conflict at hand. 4. Try "I feel" statements instead of "you" statements. For example, when you say, "You don't know what you're talking about," you are sending a "you" message. When you say, "I don't understand what you're discussing," you're using an “I” statement. "You" statements often make the other person feel as if they are at fault or being blamed. "I" messages clarify your own feelings about the situation. In general, using "I" messages show your concern with the issue. In contrast, using "you" messages tends to feel harassing to the other person. 5. Use your brain and set aside your emotions. This is often the most challenging of the five techniques since verbal conflict by nature is emotional. The end goal is to turn the verbal conflict into productive discourse. 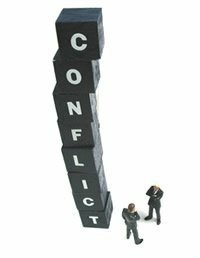 Verbal clashes are counterproductive in both professional and personal situations and often escalate quickly. Instead of letting your emotions decide the direction of the conversation, ask yourself, "How can I help solve this problem? What resolution will work best for both of us? What can I do to help this conversation end well?” You need to rein in your emotions for the sake of resolving the issue and also to help both parties to feel respected and heard. Few of us enjoy verbal conflict, yet it's something we know we can't avoid! Learning how to better respond in a disagreement can actually be pivotal to whether or not the conversation has any useful results. Using these five techniques gives you a much better chance to help both you and the other person to feel valued and understood. And for an uncomfortable dialogue, can you think of any better way to feel?